Stock indices all over the world have recovered from their lows in March 2009. Similarly, commodities have rebounded from their nadir at the beginning of the year. Everybody is quick to point to a recovery from recession. Not so fast. Indices and prices that move with a high volatility cannot be explained simply by fluctuations in supply and demand. Something with a more powerful force could have accounted for the movement. If you travel in a moving object, things outside the object will fleetingly pass you by. Only a fool would imagine that the world is moving while he is sitting still. In like manner, if you believe that the volatility in the stock markets and commodity prices are due to demand and supply, then you've been taken for a ride. First, we need a primer on demand and supply. Our common understanding of demand and supply is that price is the mechanism that matches demand and supply. If demand exceeds supply, price rises and vice versa. But this law overlooks one crucial element: the medium for the price. Nowadays it is fiat money, a currency with no precious metal backing. The value is decided by the authorities. Demand and supply can remain the same but if the currency volume is increased, the price will follow suit. This is where Ben Bernanke comes into the picture because he's in control of the one tool that significantly affects stock markets and commodity prices: money printing or also known by its current euphemism, quantitative easing (QE). Herein lies the problem with Bernanke. Abraham Maslow's quote, "If you only have a hammer, you tend to see every problem as a nail", aptly fits him. Bernanke is using his hammer to maximum effect. He keeps pounding on all economic problems regardless of whether his hammering will bring the house down. To understand the danger of Ben's knocking, let's have some basics on modern day money supply in the US. Why the US? Because the US is the primary locomotive of the global economy that even other large economies, such as China, Japan and Germany largely depend on its growth to drive their own progress. A good indicator of the money supply in the US is not the money supply computed by the US Fed. It's actually the total debt in the US. The official money supply reflects only the debts or loans made by the US banks (debts or loans appear on the asset side of the banks' balance sheets while the liability side is made up of deposits and checking accounts, i.e., the money supply). Not only is the banks' money supply incomplete, it has also been muddled by securitisation and the banks' hiving off the loans to off-balance sheet vehicles. As debt plays an increasingly important role in the economy, it's useful to study the chart below from the NY Times. It plots the US debt growth from 1953 to 2009. The period 1971 to 2008 marks the growth of debt that surpassed the GDP growth. This period is described in detail in another post, "From Nixon to Bush: The debt financing of America." Another chart below shows the ratio between the total debt and the GDP. What is interesting about these two charts is not the extremities to which they are heading. Since the future is more exciting than the past, we want to identify the patterns that will unfold. After all, anybody can rationalise the past regardless of how flawed their arguments are. Looking at the first chart, you can can see a faint outline of a bell curve while the second clearly marks the shape of a developing S-curve. Now you know the relationship between the bell curve and the S-curve. For the mathematically inclined, the bell curve is a derivative of the S-curve. Both are laws of nature from which there is no escape. You can deviate but the laws will pull you back to their predestined paths. 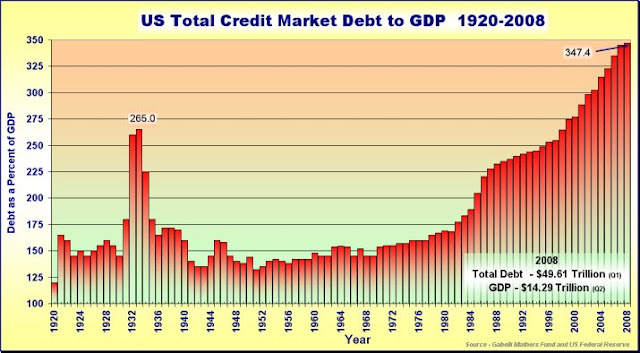 Both curves indicate that the American debt explosion has run its course. The debt is already past its prime. The S-curve is plateauing and probably drooping over the coming years. The bell curve shows a major correction, a big downward shift after Bush's aberrant move upward. This shift spells disaster presaging a rating plunge for Obama. His damage control, in the face of slumping debt positions of all other sectors, is naturally to accelerate deficit spending. The just released 2009 federal fiscal (year ending 30/09/09) deficit was $1,417 billion, amounting to 10 percent of US GDP. But how does this stack against the big picture? 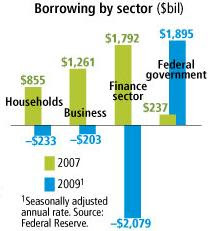 This chart from Forbes 02/11/09 shows Obama's deficit couldn't even cover the collapse in the finance sector debts. The total debt movement may go into negative territory this year. So now we are left with Ben Bernanke's frantic bungling in the debt market. Bernanke thinks that the problem is liquidity. Because that's what Milton Friedman and Anna Schwartz identified as the cause of the 1930s Great Depression. They couldn't have been more wrong. The real cause for the Great Depression and the present one is not liquidity but capacity (see It's capacity, not liquidity, stupid). Because of his misguided view of the cause of the crisis, Bernanke has pumped more than $1 trillion buying all sorts of debts, from Treasury bonds to asset backed mortgages to corporate papers. Before the crisis, Fed's holding of debts was $870 billion. Now it's $2.1 trillion. He thought that with more liquidity, the credit market would start moving. But surprise, surprise, it's not budging. The extra liquidity is being used not to create more debts but to speculate in stocks, commodities and bonds. Since this is a capacity crisis, nobody would want to borrow for investment because all over the world, there's surplus capacity. Only fools believing the rising stock prices as a portent of an improving economy will rush to invest. The wise use this opportunity to reduce their debts, cut expenses and sell off surplus capacity. Bernanke will come to realise that when confronting the laws of nature, there are limits to what the Fed can muster. And for Obama, he will come to rue his appointment as President and be sensible enough to stop harping on his predecessor's legacy. The past presidents had to do what had to be done; they were under the yoke of the debt. Obama's job is to manage the debt transition from its growth phase to the maturity phase. There are no two ways about it; the laws of nature dictate so.